Safety/Service Director Brian Shidaker talks to the council about fixing street lights around the city at Thursday’s meeting. 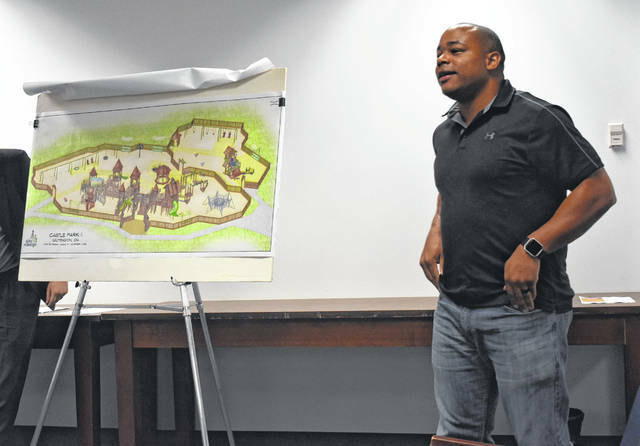 City Parks and recreation Director Jermaine Isaac gives Wilmington City Council an update on the new wooden playground planned for David Williams Park at Thursday’s meeting. WILMINGTON — Collaboration was a recurring theme during Thursday’s Wilmington City Council meeting. During the President of Council’s segment of the meeting, there was a “cavalcade of non-profit reports” as President Mark McKay said. Representatives from Main Street Wilmington, the Clinton County Conventions & Visitors Bureau (CCCVB), the Economic Roundtable Development, and the Murphy Theatre presented how 2018 was for them and what’s in store for the coming year. She cited, as an example, their collaboration with United Way of Clinton County for the Chili Cookoff and Beer Rally. With the chili being added, it opened the door to a whole other audience that may not have shown interest in the Beer Rally. For 2019, they plan on continuing their collaboration efforts and working on continuity. Susan Valentine-Scott, Executive Director of the CCCVB, shared their 2019 budget and the 2018 actuals with council and expressed excitement for 2019. She shared the budgets for individual county events including the Banana Split Festival, Rock the Block, and the Blanchester 4th of July celebration. Dan Evers spoke on behalf of the Economic Development Roundtable about collaborations local organizations have been working on and how they have been working to be more effective together. Maretta Alden, Executive Director of the Murphy Theatre, shared a letter detailing what they accomplished in 2018 including the various updates and their successful 100th anniversary celebration. During the City Services Committee report, council approved a resolution allowed Parks Director Jermaine Isaac to enter into an agreement with Play By Design, LLC for the new wooden playground planned for David Williams Park. Isaac told council that, while there is still some funds needed, they are ahead of schedule and and they’ve already started planning and organizing for the community construction of the new wooden playground. Isaac displayed the final design of the new playground and highlighted that it is an accessible playground for children in wheelchairs. Reagarding construction, he noted they originally played to start construction in fall 2019, but that has changed for the better. For the community build, he said they would divide the work into three shifts per day and would need 70 people per shift for the seven-day project, with the hopes of having it built by June 7. He added they would get help and supervision from entities including Laurel Oaks and TimberTech. He invited local residents to, if they wish, take photos of the old wooden playground while they can — and they would organizing a “selfie day” with it sometime in February or March before the demolition. For more info about the project and for contact info, visit wilmingtonparks.com. 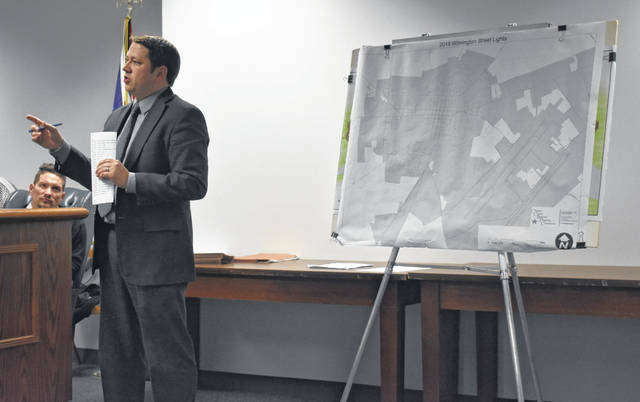 • Safety/Service Director Brian Shidaker informed council they are looking forward to repairing broken street lights. Shidaker added that if anyone notices a broken light, to get the number of the pole and call the municipal services department at 937-382-6509.